Reissue of the third classical demo BEHEMOTH. On this team you do not have much to write. We are proud to present the limited editions of this demo on prosessional tape . Porfesional printed double-sided tape and a printed insert. There had been a long hard road out of hell until the cursed day when the furious intensity of the Eastern beast, set up by Nergal, the main man behind the band, struck the world in mid 1991. 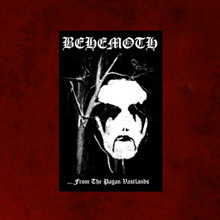 Following the paths of the ancient heroes like VENOM, early FROST or first Norwegian black metal acts, Behemoth started their unearthly existence with a couple of raw and primitive rehearsal tapes (“Endless Damnation”) and demos (“The Return of the northern moon”), the most significant of which was the second one – “From the pagan vastlands” (1993), showing the growing potential of the main composer/writer. This tape was released by polish label Pagan Rec. and later on by infamous American Wild Rags which pressed this stuff on CD. Signing with a minor Italian company Entropy rec. the band had the chance to record their debut release, a mini album entitled “And the forests dream eternally” (1994) followed by the full length with Polish underground label Pagan records. Now, after two decades later, when Behemoth dominated extreme music everywhere and became most famous Polish act worldwide – Witching Hour Productions proudly presents reissues of cult second and third demo on LP, CD and MD. All those releases are strictly limited with refreshed lay- out and original graphics. LP will be released as black-white vinyl, picture disc with poster, patch and sticker and as black 180gr vinyl – this one only as box edition. Recorded and Mixed in “Warrior Studio” December 1993 E.V.